A Campus GT Instructional Needs Committee meets to review all of the data and determine services. The committee may request addition information such as a portfolio of student work, and/or an additional critical thinking assessment in order to determine how best to meet the student’s needs. Information from private testing is considered, however, scores from private testing do not supplant scores received through Eanes ISD testing. Individual Education Plans and 504 Plans will be taken into consideration. Appeals: A parent/guardian, student, or educator may request an appeal of the Campus Committee’s decision within 30 days of the date of notification. Parents may initiate an appeal by completing an appeal form after they have met with the campus GT Specialist. Furlough: Upon written request of the parent/guardian, a student may be granted a leave of absence from Gifted & Talented services. A furlough may be granted for reasons such as class schedule conflicts, student illness, serious illness or death of a family member, and short term relocation of the family. Exiting Procedures: Exiting of students from the Gifted & Talented program is based on multiple criteria including student performance in the program. Exiting is finalized by committee decision after consultation with parents and students regarding the most appropriate educational placement. Transfer Students already identified as GT: A student receiving Gifted & Talented services from another district that transfers to Eanes ISD may complete a Transfer Referral Form. Once the Referral Form and complete records are received by the campus, the student will be assessed following Eanes ISD GT guidelines. Placement decisions will be made in a timely manner after receiving the the completed Transfer Referral Form. Transfer Students NOT already identified as GT: A student that is not receiving Gifted & Talented services from another district that transfers to Eanes ISD will have the opportunity to be assessed for GT during the next assessment period. In order for your child to be assessed for the EISD GT program, you must complete the GT Consent to Assess Form. Please complete the form one time for each child. Click on the button below to access the online form. 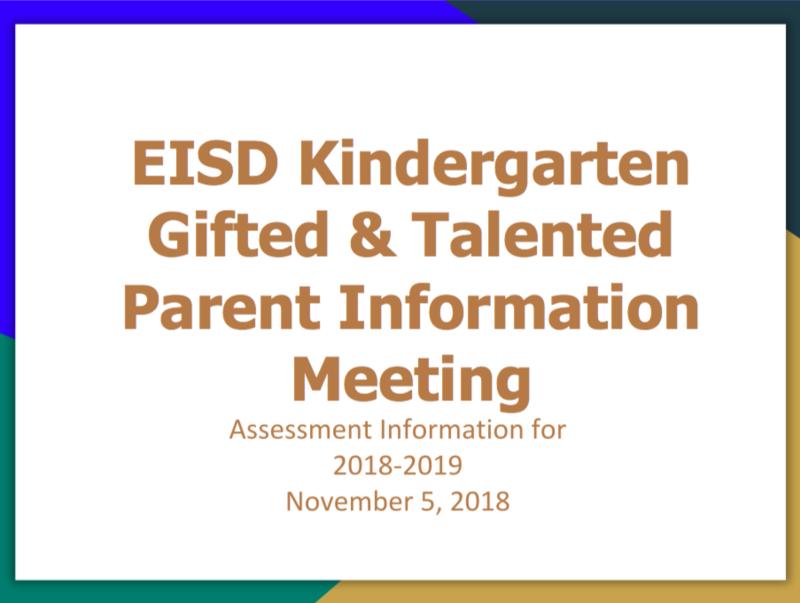 If you were unable to attend the EISD Gifted and Talented Parent Information Meeting, please download the PDF which explains more about the GT assessment process.